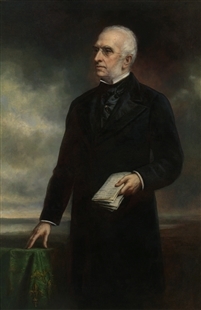 Joseph Varnum’s Speaker portrait— along with those of Speakers Banks, Sedgwick, and Winthrop— were given to the House of Representatives on January 19, 1888. 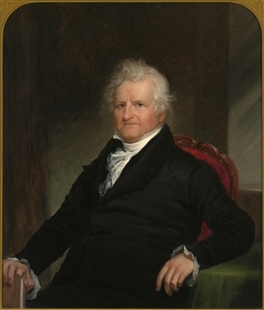 Charles Loring Elliott, a prolific mid-nineteenth century portrait artist known for his fluid brush and unsentimental likenesses, based this 1850s portrait on an even earlier work by Ezra Ames that was painted during Varnum’s lifetime. The portrait’s emphasis on lively textures—such as the sitter’s unruly hair and lace cuffs and collar—give the painting a sense of movement and vibrancy.